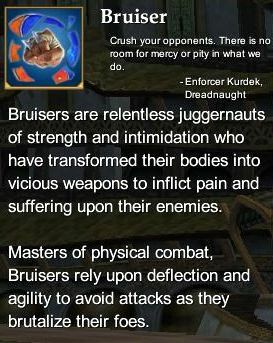 The Bruiser profession is ideal for those who want to pummel their enemies hand-to-hand. The Bruiser is a juggernaut of physical pain, having transformed their body into a vicious tool for inflicting suffering on their foes. The honing of the Bruiser's physical body conveys offensive as well as defensive advantages. The Bruiser is most effective on the front lines of combat. This page last modified 2011-08-25 22:55:54.